The second inauguration of President Barack Obama included some of the highest-ranking and most eloquent dignitaries and leaders in the entire country, including Retired U.S. General Wesley Clark, noted journalist and author Bob Woodward, and former U.S. Secretary of State Dr. Condoleezza Rice. Added to that list was South Euclid Lyndhurst Schools’ Brush High School sophomore Chelsea M. Conwell, who attended through the National Presidential Conference program. Her demonstrated leadership qualities and academic acumen provided her with this opportunity through the program. She describes her experience at the inauguration as ‘surreal,’ and was privileged to be attending the inaugural celebration of the first African American president on Martin Luther King Junior Day. 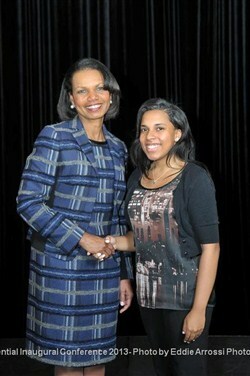 After the inauguration she had a chance to meet various leaders and found her greatest inspiration from her encounter with Dr. Rice, who encouraged her by remarking, ‘instead of letting someone judge you on how you look, you have to work even harder to prove them wrong.’ In addition to meeting such political and social leaders, she also attended activities with her peer high school leaders from across the country who shared ideas and engaged each other about how they are helping to improve their communities! The SEL Schools congratulate Chelsea on this once-in-a-lifetime experience!